The Projects Abroad Micro-finance Project in Ghana will be moving from Akuapem Hills to Cape Coast in April 2017 to provide support to entrepreneurs at a leprosy camp and empower business women in a local fishing community. The Micro-finance Project has had a busy few years, and in 2016 alone 80 beneficiaries in Akuapem Hills were given financial support and training so that they would be able to start their own businesses. Owing to the sustained success of the business owners and the community as a whole in Akuapem Hills, the Projects Abroad Micro-finance Project will now be shifting its focus and activities to support other communities in need in Ghana. 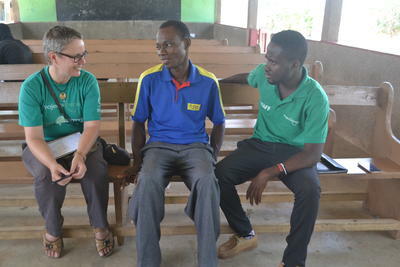 One of the communities selected is a leprosy camp on the outskirts of Cape Coast. The village-like camp is home to people struggling with leprosy, as well as their families. Leprosy is a chronic, curable disease that affects the skin and nerves and is transmitted through close, repeated contacted with an untreated person. 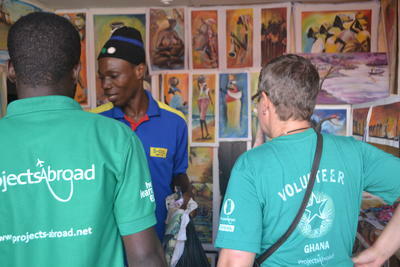 “Despite progress being made about its transmission, there remains a stigma around leprosy in Ghana and many people still believe that those who were affected are still highly contagious or that they have a bad omen, so they are shunned from society”, says Jenny Puyo, the Projects Abroad Head Office Coordinator for Ghana. It is because of this belief that they continue to live life as outcasts, receiving very little care and support. Members of the camp are eager to be more self-sufficient and many have started their own businesses. However, as leprosy is considered a disability, these entrepreneurs struggle to access loans that are needed to grow their businesses. Projects Abroad is the only organisation that offers financial support and business training to this marginalised community. John, who is the leader of the leprosy camp, has been the voice of this community for the past 30 years. He knows the struggles that they face and the community welcomes the assistance from Projects Abroad. “Most of these people really need the help and the Micro-finance Project is going to be one of the best things for them as getting a loan is challenging. Living here is difficult and the project will help people put food on the table, which is something they struggle with every day,” says John. Projects Abroad is not only providing loans to local business owners. The Projects Abroad Medicine Project in Ghana has also been trying to raise awareness about leprosy and volunteers are helping fight the disease by providing access to free medical treatment. By offering free healthcare this project is able to limit the damage and impact of this disease on members of this community. Beyond the leprosy camp, Micro-finance volunteers will also be working with a group of women in Abukem village. Fishing is the main source of income in the village but it is a seasonal business and dominated by men so the women want to start businesses of their own. Local women often do not have access to proper education so volunteers will focus on teaching basic numeracy, literacy and English language skills alongside business skills workshops. Projects Abroad loans will be allocated based on the attendance, performance and progress of applicants at these workshops. The main aim of the Micro-finance Project is to give people from underprivileged communities the chance to secure a sustainable future for themselves and their families, through small scale businesses. “This is a great way to create new employment opportunities and empower the locals. In the long run this will encourage entrepreneurialism and help develop and uplift the communities and the future prospects of its people,” says Jenny. Find out more about our Micro-finance Project in Ghana to see how you can contribute, or take a look at how you can make a difference at one of our wide range of Micro-finance Projects around the world.